Sorry you had this problem, but it is very common for flannel to have a higher shrinkage rate than regular cotton fabrics. At least you washed before quilting! Bet you won't do that again....LOL....been there, done that. Actually ... one wash for flannels does not mean it is fully shrunk! I actually got a pleasant surprise with some flannel I recently purchased at Walmart I prewashed it before cutting some items for my niece's new baby and it didn't shrink. Walmart was my only choice for fabric because it's the only place in the county that sells fabric and we just got that back. JoAnne's flannel has always shrunk for me plus having to allow for those extra wide selvages usually means buying extra fabric. true. I shrink flannels (and denim, if I'm using new denim for something) at least twice, maybe 3 times. I may not *wash* them every time but I make sure they get fully wet and put in the dryer a couple of extra times. Recently made a flannel quilt for DH. Prewashed everything. I'm sure it all shrank, since I didn't premeasure, not sure how much. I had high quality from LQS, thinner from Joannes, and assorted leftovers from a friend. 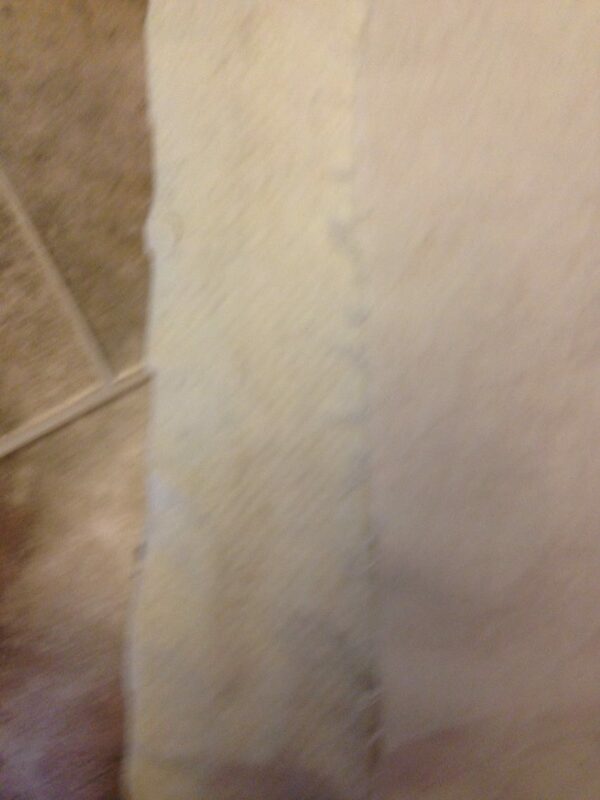 After washing the thinner flannel from Joannes was noticably narrower and also thicker. It felt more stable. I liked the change. And since all have been prewashed to shrink and remove some extra dye, I think they'll play better together. Thanks for the warning. I bought some Joann's flannel to teach my DGD how to sew sleep pants following a pattern. I washed and dried it once, but I think I will do it again! I wash it in hot and dry it on hot ... give it the most abuse I can! When I told a friend that I had flannel shrink after washing the fabric a few times, she told me that I needed to dry it with some towels, to give it something to bounce around with as it would help with the shrinkage. Seemed odd to me, though I have not had any problems since. As for all the fuzz off the flannel ... that is almost endless, if you have a good quality! My experience with flannel is it shrinks alot! I just purchased some flannel from Jo Ann's last week for my husband's lap quilt. After washing and drying the flannel, I'm already in the process of sewing it to the quilt top. Now I see someone mention washing and drying flannel more than once. Not sure I want to rip out what I already sewed to wash and dry it again. Hopefully it will be okay? ScrapyAZ, don't worry about washing/drying again since you have already stitched it to the top. At least you've washed it once. I prewash all my flannels since not all of them come from the same store and they do not all shrink at the same rate. I do it once and do not worry about washing it again. you should always buy more flannel than you need. Then before you cut it you should finish the ends and wash and dry it three (3) times. This usually takes care of all the shrinkage. I even had expensive Maywood Flannel shrink. Started out at 42" wide - shrunk to 37" wide. I ALWAYS now wash my flannel in very hot water and dry at high heat. Yes, this does not insure no additional shrinkage, however as I am not usually a pre washer, I figure if it shrinks a tad more it is OK. I sure hope you're right! This is my first time working with flannel, and I'd hate to have problems with it. Is there anything I should do after the flannel is completely stitched to the top? Fingers are crossed! when I purchase flannel I usually get an extra 1/2 yard and sometimes an extra. Can always make a furbaby a jacket! Always pre-wash everything! Don't forget, your batting will shrink some too when the quilt is washed, perhaps enough to balance out any additional shrinkage from the flannel? Even though it will shrink a little more, the majority of the shrinkage should already be done with the first wash and dry. As long as the flannel piece is as big as your quilt top, I wouldn't worry too much about it. I personally love the nice dimpled old fashioned look when everything draws up a bit in the dryer. JoAnn's flannel, that I'm afraid says it all. All flannel shrinks but theirs is unusually cheesy. just my opinion!!! I agree about Joann's. I have some flannel fat quarters from them and after washing, they are closer to parallelograms (very bad ones, at that) than rectangles. No reason to fear it ... just do what needs to be done ... then ENJOY it! I steer clear of flannel too because it not only shrinks, but also some of it will pill too and I can't tell before washing it which will pill. I could work around the shrinking more than the pilling. I was told by a quilt store owner that she doesn't wash her flannels first, gulp. I just make sure I buy the flannels from LQS and generally avoid flannels from non-quilting stores. I do wash my flannels first before cutting. Since I use cotton batting for my quilts, there is a bit more shrinkage after the completed project is washed. It creates a lovely look! Unfortunately, I have had LQS flannel shrink as much or more than JoAnns flannel. Recently, I had a Maywood flannel shrink 5" wof and a yellow checked JoAnns shrink only 3" wof. I do have to say that I am picky about my flannel and if it is cheesy feeling or thread count is low it does not get purchased no matter where it is. I use a lot of flannel for backings. It is what it is and I figure that the first washing and drying will do most of the shrinking. I use Warm and Natural for most of my batting. It too will shrink a bit, so I always hope that they both will shrink about the same amount -lol.